Feeling a little motivated this morning, I pulled out one of my junk drawers. This one is literally labeled JUNK as it doesn't fit into any of my other junky categories (keys, charms, rhinestones, buckles, etc.). After sorting through it for a few minutes, I had this laid out on my desk. It's all very organized in my eyes. On the left is my junk drawer. Along the top are some items I want to solder for various reasons. There's a lot of safety pins in the mix because I want to make them even more safe by soldering them closed. That'll make me feel better about using them in jewelry. Along the right are the pieces for two possible necklaces. The bolt-like thing on the top is on its own as it looks something like a bail to me. The other pieces may likely come together in some sort of tassel assemblage piece. In the center of my desk were some watch backs. I realized there were a ton of them in the drawer. As I pulled them into a pile, I saw that they would be perfect for a statement necklace of some kind. But, first they need holes. After making an arrangement that made me happy, I marked where I want holes and numbered some of the pieces. That wonderful man-of-mine will use the drill press to make the holes for me. And, this picture and the numbers will serve as fabulous reminder of this arrangement. Now to actually pull all this together and make some jewelry! Do you see jewelry here, or do you just see junk? 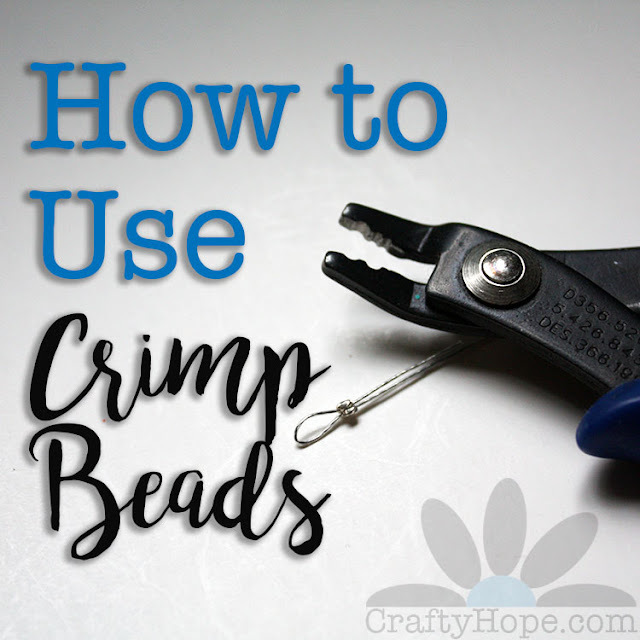 I'm linking up on The Stamping Ground for What's on You Workdesk Wednesday. Hi there. I don't think I have been over to your desk before - but then, I have been mIA recently... You are certainly going to be busy with your "junk". Have fun. I meant to talk to you tonight about the pin for your costume but it slipped my mind. I'm sure we could come up with something if you need me to. I've got pin backs (I think) and flat surfaces! I certainly see 'treasure' rather than junk. 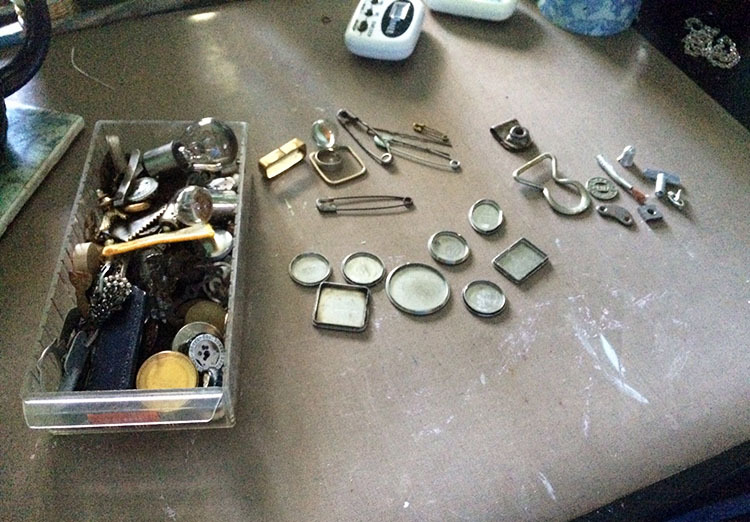 What a fabulous drawer you have - love all those little pieces and can see them coming together for some jewellery. Look forward to seeing a finished piece or two. Thanks for visiting earlier, I had a streak of ambition set in and I started cleaning the garage, which lead to outside clean up. Fall is messy but the colors here have been wonderful. Great photos of fun things in that junk drawer. Have fun creating and enjoy a fun week. I can see the beginnings of some sort of jewellery. I hope you show us how it turned out! Yay!! I'll definitely work to try to get something done to share next week. I'm horrible at starting but not finishing. With my soldering iron waiting on my desk, I hope to get back at it first thing in the morning! 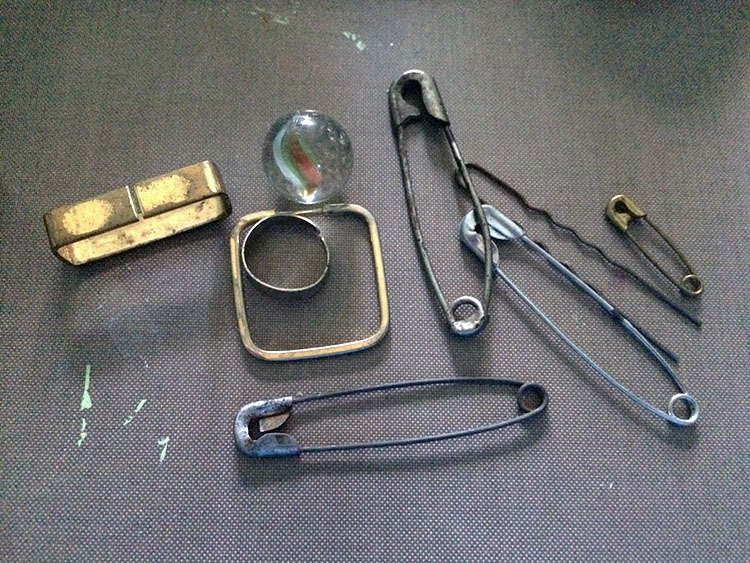 You really can handle junk :) I'd love to see what you do with these pieces, especially the watch backs! Zsuzsu, Oh yay! I'm so glad you see treasures too. I do have quite a bit that will eventually work its way into mixed media canvases (once I get brave enough to do so.) I'm glad you see that as well! Thanks so much for popping in also! I do love my collections! I finally got started pulling some of it together late today. Hopefully I'll have something to show by next week! Thanks so much for popping in! Hi Hope, I am intrigued to see the finished project. Angela, I do hope I get something finished to actually show!! eek! Pressure. I will definitely share what I get done. Thanks so much for taking the time to swing by! Mm the sidebar on your blog interferes with commenting I lost the first one because something changed on it, quite weird. Thanks very much for popping over and saying hi. ..... your query re the giant lemon, I took it up to my sister's. I'm enjoying my big bunch of sweet peas today, they're ever so lovely. Fragrance fills the house. Must admit I scrolled down to see what you did with the bits and bobs your recycle and you do make some lovley pieces so glad you can upcyclelike that, acrafty creation of worth, well done. 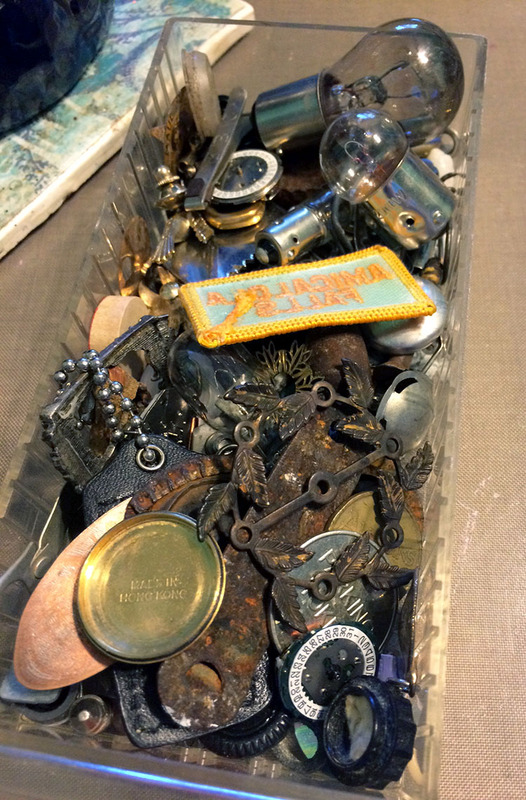 Fabulous stash of "junk"! 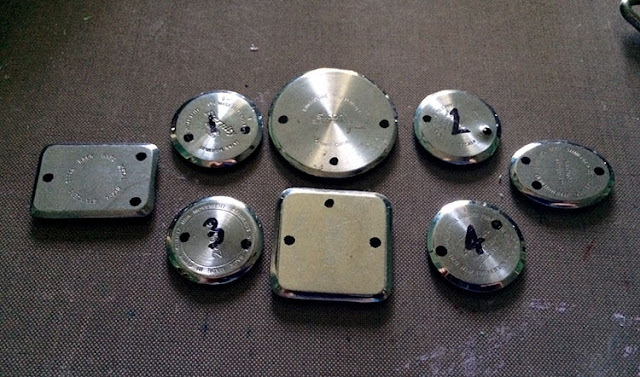 Do you pull the watches apart and use the interesting bits from inside? I agree metal bits and pieces are definitely treasures. Can't wait to see what you create. thanks for your visit and lovely comments. Vicky, I hope I get finished! Ha!! Actually, I'm working on the first project right now, hoping I get something done worth showing!! Thanks so much for coming a by! 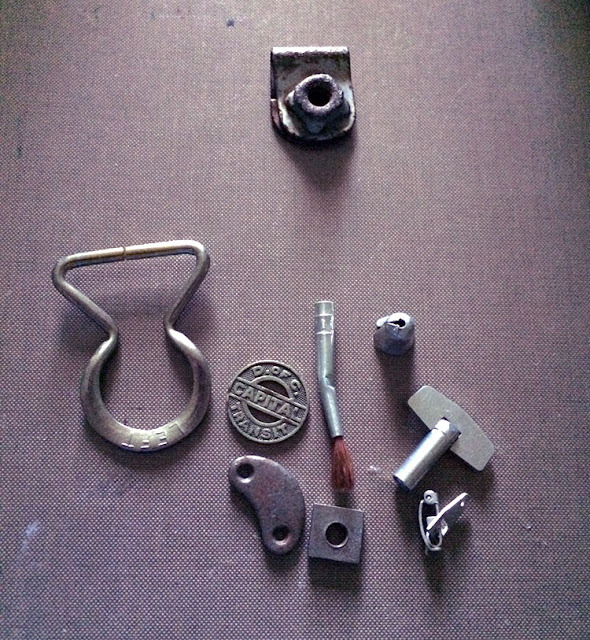 What a fascinating post, Hope, and what a glorious collection of bits and pieces! I'm a bit of a hoarder of stuff like this (part of the "it might come in useful" syndrome lol!) so I certainly don't see it as junk! I do hope you will share with us what you do with it it's fascinating! Thank you for your lovely comment - my hubby went to Mum's home again today and came home doing another impression of the awful old lady next door to her - I find it hard to believe there's actually someone more awful than Mum lol lol!! But it seems there is! Thank you for your kind words - so glad you like my digital art. The iPad Pro and Apple Pencil combo are so natural to use that you almost forget you're not working with pen and paper. As for my health, I think I'm over the gastroenteritis now but saw the doctor yesterday and am now on anticoagulants for the pulmonary embolisms and they've discovered I've got a hernia around my stoma, so more ongoing problems! Got to keep smiling though, haven't you! I've got a necklace complete with some of the treasures and am waiting (still) for the hubs to drill those holes for me. But, I'll definitely try to share what I get done next week! I'm glad they at least know what's causing the pain around your stoma. Hopefully it can be treated so you can start getting past it. Wishing you all the best!! Thank you for popping in!! I see both jewelry and junk. I can't wait to see your finished pieces! Sorry I'm so late! Have a great week! Heather (waywardgypsy) #51? Ha, I guess I do too. Otherwise I wouldn't have named this post as I did. I've got one necklace down and am waiting for Mr Man to get those holes drilled for me. I figured that would be my biggest hold up, he gets so involved in his own projects. Thanks so much for swinging by! You are a kindred spirit! I adore cogs, gears, engineering bits and pieces etc. I am REALLY looking forward to seeing how the jewellery turns out! Not junk!! Lots of fantastic findings full of wonder and possibility!!! I like your Junk drawer! and Thank you for visiting me! from SusanLotus nr 32 WOYWW. Hi. What a great junk drawer! I can't wait to see what you create!! Oh I am SO pleased I am not the only one who has these types of drawers! I have broken my soldering iron and am almost out of resin so my junk drawer appears to be getting bigger and bigger! Looking forward to seeing what the finished necklace looks like. Well, that's an interesting desk this week! Nice to see something a little bit different... Can't wait to see what you come up with jewellery-wise. I should have a necklace to share, but that's as far as I've gotten so far. Eeek. I guess I need to get to work! Thank you for popping in too! 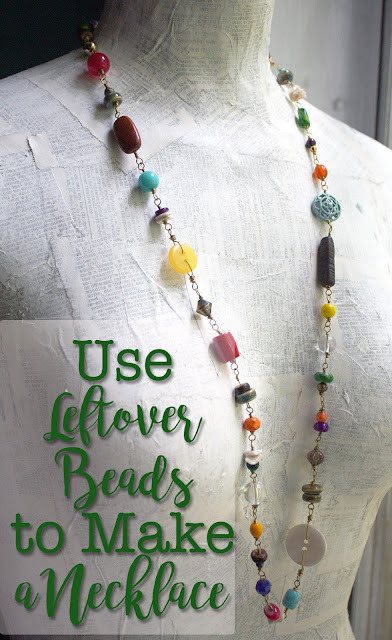 Very clever idea to use old keys to make earrings! Thank you for visiting me last week on WOYWW!